Davis-Besse nuclear power station 25 miles east of Toledo, Ohio, where FirstEnergy plant owners falsified records about damage from boric acid that nearly ate through a 6-inch-thick steel reactor cap. Photograph by Rad Journal. 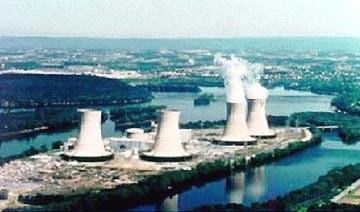 April 12, 2004 Harrisburg, Pennsylvania and Washington, D. C. – One man who has lived in Harrisburg all his life is Scott Portzline, Security Consultant for Three Mile Island Alert. Born in 1958, Scott was twenty years old when TMI’s Unit 2 reactor began to melt down. Five years later in 1984, he wanted to know the truth about what had caused the near-meltdown. A decade later, Scott had lost confidence in government explanations and began to question how much radiation had escaped from the TMI reactor. What had radioactive contamination done to the people, plants, animals and insects? Why did the government and nuclear industry tell the public that only small quantities of radiation had been released with exposures far below levels that could affect health? In fact, the Nuclear Regulatory Commission (NRC) and the 1979 President’s Commission on the Accident at Three Mile Island concluded that the maximum possible radiation dose beyond Three Mile Island was less than average annual background levels. How was that possible if up to 13 million curies of radioactive gases and up to 17 curies of radioactive iodine were released during the disaster? Scott became increasingly disturbed by what he learned and his research has been cited by the U. S. Department of Energy, Stanford and Harvard Universities, and various military branches. Scott Portzline, Security Consultant, Three Mile Island Alert, Harrisburg, Pennsylvania: “Just one curie is 37 billion radioactive disintegrations per second, and each disintegration has the potential to harm a human cell. If we multiply 37 billion disintegrations per second by the 13 million curies released at Three Mile Island in 1979, we get a number so big that you have to state it scientifically: 4.81 x 10 to the 17th power. Scott Portzline: “The nuclear industry likes to say how much safer things are today after the 25th anniversary of Three Mile Island. But listen to the track record of the industry just in the last half of March 2004. We do see and are concerned that another accident (like TMI) is just a couple of years away as all the nuclear plants age. – So far, there have been 8 reactor scrams. – 2 manual shut downs. – 1 low level emergency declared at the St. Lucie plant in Florida during re-fueling when a reactor coolant started leaking. – The high pressure injection systems were found inoperable at 3 plants. Two plants were in Pennsylvania ­ the Peach Bottom and Limerick plants ­ and this is a major safety system. – Cracks were found in the Susquehanna Pennsylvania reactor. –Both emergency diesel generators were found inoperable at the Cooper plant in Nebraska. – It was discovered that an earthquake could cause electrical short circuits at the Wolf Creek reactor in Kansas. – Three workers were injured when their bucket truck contacted a high voltage line at the Susquehanna reactor. – And a fourth worker injured his hand when a grinder he was using lost power during that event and he lost control of the grinder. – Two supervisors were found to be on drugs, one at Turkey Point in Florida and another at Callaway in Missouri. – Two incidents of controlled substance testing were positive in the workers. – A guard shot himself in the leg at San Onofre in California. 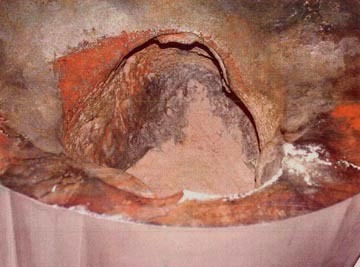 Large hole eaten away by leaking boric acid from a cracked reactor drive nozzle at the Davis Besse nuclear power plant in Toledo, Ohio. Discovered in 6-inch steel casing and photographed in spring 2002. Plant shut down to avoid potential core melt down. Photograph from Nuclear Regulatory Commission. In the spring of 2001, the Ocone nuclear power station near Greenville, South Carolina, which is a sister plant to both Davis-Besse (Toledo, Ohio) and Three Mile Island (Harrisburg, Pennsylvania) found some cracked pipes. These pipes passed through the very top of the nuclear reactor vessel and the cracks allowed reactor cooling water to leak out of the vessel. Because of that discovery, the Nuclear Regulatory Commission (NRC) asked that all nuclear power plants with similar configurations look at the pipes and see if they had cracks and to fix them or verify that they were crack-free. Davis-Besse was one such plant and one of the oldest in the United States. The NRC staff was so concerned about safety at Davis-Besse that in September and October of 2001, they drafted an order that would require Davis-Besse to shut down for safety reasons. The owner did not want to shut down the plant. So, the owner came in and met with the NRC staff in October and November of 2001 and provided reasons why they thought the plant was safe to keep operating. The NRC looked at that information and ultimately agreed with the plant’s owner and did not require the plant to shut down. But later in the spring of 2002, when the plant was finally shut down for a scheduled re-fueling outage, very serious cracks in the nuclear reactor vessel were found, boric acid was leaking out of those cracks and had eroded a large hole through the 6-inch steel cladding in the reactor vessel beneath Nozzles 1, 2 and 3. Undetected, that ever-widening hole at Davis-Besse would have lead to a core melt down event. Once that near-miss was discovered, the NRC started investigating more closely. The investigators learned that information given to the NRC by Davis-Besse in October and November of 2001 – that allowed the plant to continue running – had been falsified. David Lochbaum, Nuclear Safety Engineer, Union of Concerned Scientists, Washington, D. C.: “The Davis-Besse plant’s owner (FirstEnergy) had said, for example, that it had fully inspected those pipe areas in 2000, 1998 and 1996 ­ the last opportunities it had to do so. But in fact, the company owner knew that it had NOT done that. It had inspected part, but not the entire area. They misrepresented the truth ­ or lied ­ to the NRC and said they had looked everywhere and had found no problems. In addition, as further proof of that, the Davis-Besse owner had showed the NRC videotapes they had made during those inspections. The inspections were only done in certain areas. But to convince the NRC that they had done more, the Davis-Besse owners basically altered the videotape and represented it as showing the entire top of the reactor when it only showed a small portion of it. So both in writing, words and in video, Davis-Besse misrepresented the actual condition of the plant to the NRC and deluded the NRC into allowing the plant to continue running at tremendous risk to the public. WHAT ARE THE LEGAL RAMIFICATIONS FOR THIS? Above: Cracked Nozzle # 3 (missing in this photograph) was undergoing repairs when a piece of nozzle sleeve fell into hole. That lead to discovering the nozzle hole was filled with leaking boric acid. Below: The boric acid ate away into the steel cladding around Nozzle #3. Images from Nuclear Regulatory Commission. 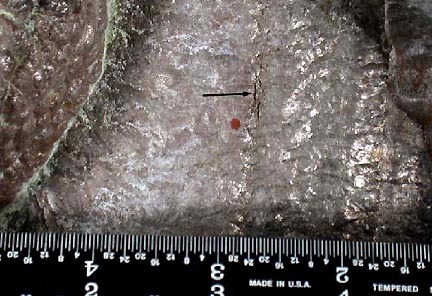 Scott Portzline, Three Mile Island Alert: “In the photographs showing the large hole and crack in steel cladding, you have to understand there are two shells: one is the inner shell made of stainless steel and that’s just about bulletproof to any corrosion. The outer shell is regular carbon steel and that is where the boric acid was eating inward toward the inner shell. Boric acid was leaking out of a reactor drive mechanism nozzle and it was eating through the steel to the point where the only thing protecting us from a terrible accident were 3/8th-inch of carbon steel. When you look at the newest photographs, you can see the cracks starting in that carbon steel and it was bulging outward from the pressure of the heated water in the reactor that is pressurized so it does not turn to steam. We were very, very close to a disastrous situation. WHAT WOULD HAVE BEEN A SCENARIO IF A HOLE HAD BROKEN THROUGH THAT CARBON STEEL? These reactors are under very high pressures, so the moment that a hole is breached in the reactor, you have what’s called ‘loss of coolant accident.’ It was believed until Three Mile Island that such a small break would not cause a problem. The NRC really didn’t study it. That’s one of the problems at TMI ­ they didn’t even study the effects of small breaks. But that type of pressure from the water shooting out could damage nearby equipment and could cause electrical short circuits and would increase the size of that hole until it released all the pressurized gases. And then the water inside the reactor itself can start to boil away and you have a loss of coolant accident where the fuel can melt. In the meantime, there are going to be systems trying to overcome the problem that has developed. One of those systems is where the control rods drop into place in a scam, provided the water spraying out of the area under high pressure does not interfere. The control rods are located in the same spot. The spraying water could work against dropping the control rods into place. Then you might not be able to get the control rods inserted in time. Without that, you have a smaller chance and more difficult task of halting the nuclear chain reaction and they would have to dump borated water ­ neutron-killing water ­ into the reactor. Of course, some of that is going to boil away and you have a boron release into the containment building, plus all the other radionuclei. 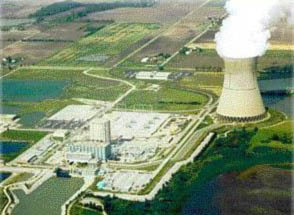 On February 16, 2002, the Davis-Besse Nuclear Power Station in Oak Harbor, Ohio, began a refueling outage that included inspecting the nozzles entering the head of the reactor pressure vessel (RPV), the specially designed container that houses the reactor core and the control rods that regulate the power output of the reactor. Of these vessel head penetration (VHP) nozzles, the licensee’s inspections focused on the nozzles associated with the mechanism that drives the control rods, known as the control rod drive mechanism (CRDM). Both the inspections and their focus were consistent with the licensee’s commitments in response to NRC Bulletin 2001-01, ‘Circumferential Cracking of Reactor Pressure Vessel Head Penetration Nozzles,’ which the agency issued on August 3, 2001. In conducting its inspections, the licensee found that three CRDM nozzles had indications of axial cracking, which had resulted in leakage of the reactor’s pressure boundary. Specifically, the licensee found these indications in CRDM nozzles 1, 2, and 3, which are located near the center of the RPV head. The licensee reported these findings to the NRC on February 27, 2002, and provided supplemental information on March 5 and March 9, 2002. The licensee also decided to repair the three leaking nozzles, as well as two other nozzles that had indications of leakage but had not resulted in pressure boundary leakage. 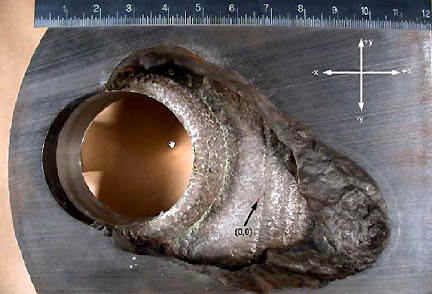 Upon completing the boric acid removal on March 7, 2002, the licensee conducted a visual examination of the area, which identified a large cavity in the RPV head on the downhill side of CRDM nozzle 3. Follow-up characterization by ultrasonic testing indicated wastage of the low alloy steel RPV head material adjacent to the nozzle. The wastage area was found to extend approximately 5 inches downhill on the RPV head from the penetration for CRDM nozzle 3 and was approximately 4 to 5 inches at its widest part. The minimum remaining thickness of the RPV head in the wastage area was found to be approximately 3/8 inch. This thickness was attributed to the thickness of the stainless steel cladding on the inside surface of the RPV head, which is nominally 3/8 inch thick. Above: Top bolted domed head to nuclear reactor vessel at Davis-Besse Nuclear Power Station in April 2000. 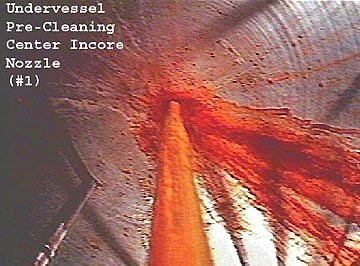 Red streams running down the side toward 25-inch-long grey bolts are from boric acid leaking from the large hole eaten away into the steel under Nozzle 3. 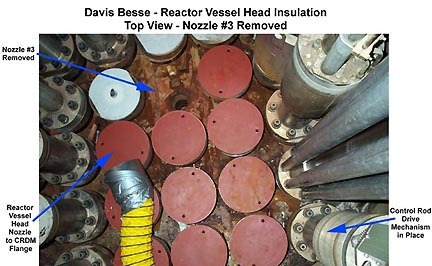 The Nuclear Regulatory Commission at first denied this revealing photograph had been given to the NRC by Davis-Besse owners. 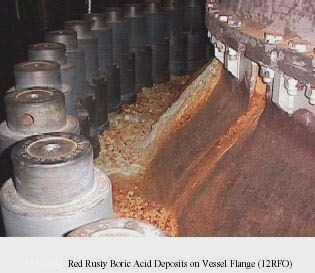 Below: Boric acid also caused red stains at Nozzle # 1 beneath the dome on Vessel Flange (12RFO) shown above. Photographs by Nuclear Regulatory Commission. David Lochbaum, Union of Concerned Scientists: “The Davis-Besse plant owners (FirstEnergy) and the NRC claim that the individuals who may have been responsible were transferred away from Davis-Besse and whether they are implicated or not ultimately by the grand jury, they are not in any position of authority at Davis-Besse. Even if that were true, the lack of justice to this date is insufficient because the people who are now at Davis-Besse need to know that the NRC will hold them accountable for lying about safety. In addition, if the guilty parties are no longer at Davis-Besse, but are at other nuclear power plants, well that’s just moving a problem around. That’s not solving it. WHY WOULD THEY HAVE LIED IN THE FIRST PLACE? At the time this was all happening, the Davis-Besse company was going through a merger and acquisition with another utility. There were stock implications, price implications associated with the stock and what it was selling at in the fall of 2001. Had the plant been shut down, the price of the stock would likely have declined. That deal would have come around much differently than if all the bad news could have been pushed into the New Year after the deal was over. In addition, part of the reason the company lied was that they had experienced problems for a number of years, but those problems never lead to disasters. As annoying as those problems were, they thought they could live with them and they didn’t want the NRC to know about those problems because it was an in-house issue that they were dealing with – or not dealing with ­ much like the Challenger and Columbia disasters. There were a number of events prior to the final tragedies that weren’t fully appreciated in their full dimensions. The Davis-Besse company knew they had problems. They just didn’t understand the full dimensions of those problems until it was too late. BUT YOU ARE TALKING ABOUT THE DAVIS-BESSE OWNERS LYING ABOUT WHAT WAS ESSENTIALLY THE BIGGEST NEAR-DISASTER SINCE THREE MILE ISLAND 25 YEARS AGO. THAT LARGE HOLE IN THE NUCLEAR REACTOR VESSEL WALL COULD HAVE BEEN DISASTROUS. WE’RE AT 2004 – WHAT DO YOU EXPECT TO HAPPEN LEGALLY? Unfortunately, the NCR’s track record on cases like this is not very good. Twice in the recent past, the NRC has allowed the 5 year statute of limitations to expire before they took action. Because the 5 year statute of limitations expired, they couldn’t take any action against the individuals guilty for violating federal regulations. The clock is running on this one. We are hoping that that injustice is not repeated again. WHO CAN YOU APPEAL TO AS THE UNION OF CONCERNED SCIENTISTS? When we did the legal memo last year, we sent that directly to the Dept. of Justice because the NRC had not yet finished its investigation and it looked like it might never finish its investigation. When we heard nothing back from the DOJ except an acknowledgement that they had received our package, we then went to the State of Ohio and met with the Attorney General’s office. The Ohio Attorney General’s office was interested in the issue but felt they lacked jurisdiction. It was really the NRC and DOJ who at some point had to take action. They were very sympathetic, but their hands were tied. Ultimately, we have no appeal. We have to help the federal government do the job that it is entrusted with. SO, WHAT YOU ARE SAYING IS THAT LYING ON THE PART OF THE DAVIS-BESSE STAFF IN 2001 COULD EXPIRE WITH A 5 YEAR STATUTE OF LIMITATIONS AND NOTHING BEING DONE? It’s happened in the past. And on the current pace, it looks like it will happen again. The problem is that if workers and managers at nuclear power plants know that they can get away with such a heinous crime just by dragging their feet and not cooperating with an investigation, they are going to do it. The NRC needs to show that it puts safety and the public health ahead of the convenience of plant owners and workers. That foolishness needs to stop. WHAT WOULD IT TAKE TO CHANGE THE LAW SO THERE COULD BE MORE TEETH IN PUNISHING PEOPLE WHO TRY TO GET AWAY WITH THIS KIND OF LIE? That’s a good question. We’ve looked at that question in the past. Unfortunately, the obstacle of the Catch-22 you’re up against is that the current law has sufficient teeth if the lawmaker was just of a mind to enforce it. So, the problem isn’t that the law is weak. It’s that the regulator is weak. We need to have the NRC step up to the plate, get off the bench and get into the game and be the public guardian that is expected of them. Right now, it’s not doing that. WHEN YOU WENT TO THE ATTORNEY GENERAL IN THE STATE OF OHIO, WHAT HAPPENED? The A.G. looking at the evidence that we prepared was amazed that the NRC had not done anything. They felt there was an issue and need to take action. But they felt they did not have the jurisdiction to take that step. They felt it was the NCR’s job to take the next step and wished us luck in getting the NRC to take that next step. In some respects, the people living in and around Toledo can take some comfort in the fact that over the past two years, many millions of dollars have gone into restoring safety margins at that plant and replacing some of those (former workers) who were responsible (for lying about looking for cracked pipes). In some respects, that plant (Davis-Besse) is safer. DO YOU KNOW FOR A FACT THAT THE SAME PEOPLE WHO LIED AT DAVIS-BESSE ARE STILL WORKING AT NUCLEAR POWER PLANTS SOMEWHERE IN THE UNITED STATES? How Many American Nuclear Power Plants Today Have Flawed Drains and Pumps? What Can Be Done to Regenerate 103 Aging Nuclear Power Plants? Scott Portzline, Three Mile Island Alert: “Some plants need to be shut down and overhauled and some probably should not even be restarted. The economics of these plants is bad to begin with, so a business decision might be made to close down a plant permanently. The chances of regenerating nuclear power in this industry can only be driven by political will. The business will is not there at this point ­ it’s not economically viable. We’re seeing the political will of the current Administration that has relaxed pollution standards, yet wants to tax coal because of the pollution to create a favorable environment for nuclear power economics. This is totally backwards. They should be encouraging wind turbines which could actually generate enough electricity to supply 100% of this country’s energy needs. I thought that number was ridiculous, but there was an expanded study originally done by the Dept. of Energy that showed that using wind turbines and the electricity to convert hydrogen ­ to create hydrogen ­ and use the hydrogen in future technologies that are doable, some now and some that we can phase in gradually, would solve all of our problems and we wouldn’t have to have anything to do with these nuclear Edsels. Mary Osborn, photographer and member of Three Mile Island Alert (Earthfiles Part I), gave a presentation of her plant evidence in Washington, D.C. a few weeks ago. Mary asked Massachusetts Congressman Edward Markey (D-7th Dist) about classified 1979 TMI documents. Rep. Markey serves on the House Energy and Commerce Committee, the Select Committee on Homeland Security, the Subcommittee on Energy and Air Quality, the Subcommittee on Energy and Minerals, the Subcommittee on Intelligence and Counterterrorism, the Subcommittee on Infrastructure and Border Security, and the Committee on Resources. After Mary’s presentation, one of Rep. Markey’s staff approached her to pursue declassifying TMI documents since there is a Presidential Executive Order to automatically declassify government documents that are 25-years-old. On April 9, 2004, Representative Markey wrote to the Secretary of the Department of Energy to request that all Three Mile Island government documents, including ones classified, be released to Congressman Markey on or before April 28, 2004. Three Mile Island (TMI) nuclear power plant near Pennsylvania’s state capitol, Harrisburg, and the Harrisburg International Airport. TMI Unit 2 reactor went into melt down on March 28, 1979, releasing 13 to 17 curies of iodine and 2.4 million to 13 million curies of noble gases into the environment. I am writing to request the immediate declassification of all documents in the possession of the Department of Energy related to the Three Mile Island (TMI) nuclear accident in accordance with Presidential Executive Order 13292. In addition, I ask that you provide me with a copy of all such documents. As you know, the 25 year anniversary of the TMI accident was on March 28, 2004. On that date. Nuclear Regulatory Commission (NRC) Chairman Nils Diaz told CNN that ‘Three Mile Island was not really a disaster in radiological terms. There was no significant amount of radiation released, nobody was hurt. You may be aware that Presidential Executive Order 13292 Part 3, which was published on March 25, 2003. states that ‘Our democratic principles require that the American people be informed of the activities of their Government,’ that ‘information shall be declassified as soon as it no longer meets the standards for classification under this order,’ and ultimately calls for automatic declassification of documents that are more than 25 years old. The only materials that would be exempt from the automatic declassification requirements would be those that would threaten national or homeland security or those that reveal the identity of a confidential human source.It is in the public interest to disclose all documents related to TMI; Numerous members of the communities living near TMI have been attempting to obtain these documents for years in order to ascertain additional details regarding the radiation levels they may have been exposed to. Moreover, Americans have the right to be informed of the activities of their Government during and subsequent to the country’s most serious nuclear reactor accident. If, as was stated by Commission Chairman Diaz to CNN, no significant amount of radiation was released, shouldn’t interested parties be able to review the documents themselves in order to be sure? And if, as the NRC publicity materials state, the industry has undergone sweeping changes that enhanced safety and emergency response planning, there should be no national or homeland security risk in disclosing any previously classified materials regarding the cause of an accident that occurred 25 years ago. Please provide these documents to my office by April 28, 2004. If there are specific documents that you believe should not be declassified, please provide a list of all such documents as well as the reason why the materials contained therein should remain at a classified level. Thank you very much for your consideration of this important matter. If you have any questions or concerns, please have your staff contact Dr. Michal Freedhoff of my staff at (202) 225-2836.
http://www.ucsusa.org/ (Union of Concerned Scientists)“The Daily Outrage”Rad Journal.